I started doing the indie promos on my blog because my newsletter was pitiful. I thought I’d be able to get more eyes here. And for a few weeks my blog still had a larger reach, but now my newsletter far surpasses this blog. So I am going to take down the indie promos soon and no longer have them here. I will try and post more frequently though. If you guys do want to see promos for new free or discounted indie stuff then by all means you can join the newsletter 🙂 Or, again, go ahead and join if you want insider info before everyone else. I have also gotten a ‘real job’ for the first time in my life. I did some volunteer stuff, helped out the family business, etc, but never had a real ‘you get a check every week’ job. Now I do. Maybe even two, actually, and both are part-time so it becomes just the one full-time job. Or something. Being quite busy the last few days with all these job shenanigans I’ve found I want to make the time to write. I’ve had ideas for Scenes and backstories and extras that are all half-finished right now, but actually started. Hopefully (I say that a lot, don’t I) this will work out well. Also I need to figure out chapter names for Delphinium. Larkspur was short enough that it didn’t really have chapters, but the rest of the books will. I’m debating whether one-word chapter titles or just numbering them would be better. So yeah, a lot going on right now, and I’m starting to embrace the chaos. Working on Scene 7, ‘Wolf Girl.’ The main character is Inisaira, one of my first characters from way back when I was 13. Her story has been a constant in my mind for years, and I’m glad to be getting back to that realm (and werewolves, I love werewolves). Charting the timeline is helping me sort through 13 years of memories, old ideas, and plots that no longer work. Like with Clandestina I have several generations of stories there (I love a family saga). I’m thinking Inisaira’s story might be the second series I begin properly (alongside Pierre and Lizzy’s), but much of that is still in the air. Plus I want to write the short-story ‘Dear Friend’ (which is in yet another, third, realm) which seems too long for a Scene, but shouldn’t break 10K. I might put it up for 99cents or even free from the start. I have six or seven main realms where many of my stories take place, and many many more minor realms that I don’t know enough about yet, but plan to work in. Remember, Noctuina has 256 different magical realms, with different cræfts, bestia, and histories. Delphinium is coming along well too, I’ve been at the beach this last week and that helped with a lot of thinking and plotting. 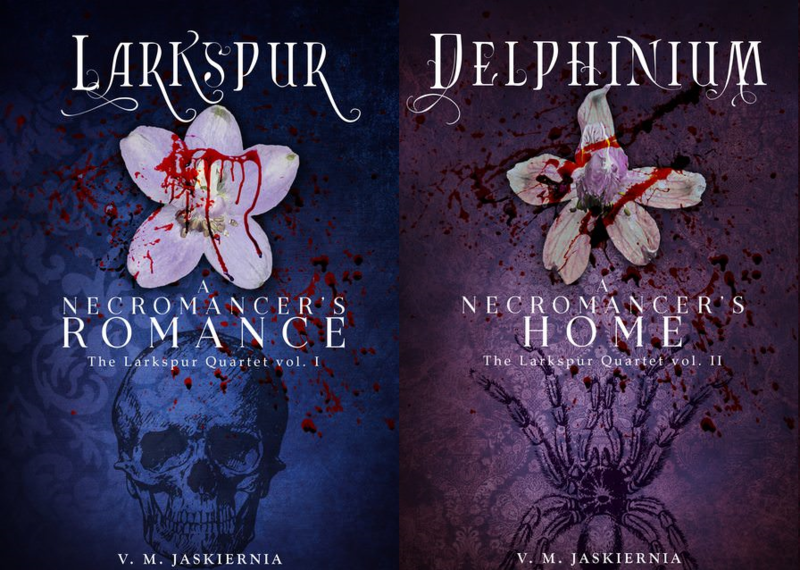 I’ve actually updated Larkspur with the opening scene of Delphinium, and an author’s note near the start. I’ve been less active online and with twitter the last few days (resulting in no sales sadly. Marketing is important people!) This may continue– my boyfriend is in town. We’re long distance (I’m in the US, him in the UK) so this is the first time we’ve seen each other in person in three years. Exciting and fun! (Not sure whether this blog is a writing-only blog or a personal-life blog, so I may write about it a little if no one objects). I started this post to tell y’all that I might be more away with this, but the opposite might happen where I’m inspired and I stay up half the night writing. Sort of want to do that now despite it being 1am. I will still be about though, and I’m going to have 15 minutes on Monday from 5:45pm-6pm where I’m at another writer’s facebook book release party. I’ll be answering some questions, and one person will be chosen/win a copy of Larkspur. I will recheck that information and give it it’s own post tomorrow. Hope everyone’s having a good day!